Popular post widget by default given by blogger. If you have not tried then just go to the Blogger Dashboard and you can easily add it. Default popular post widget is simple and not draws much viewer attention. More clicks and pageviews on blog requires proper widget and layout selection. Previously i have been using the default blogger popular posts widget and not getting enough clicks. Viewer just left out after reading the few posts because that widget was simple in looks and not eye catchy. So i suggests you to add the catchy widget according to your blog Background color, fonts and Layout. Let me give you some stylish widget for your blog. You can Modify all the attributes inside that widget through css stylesheet according to your choice. Blogger Popular Posts widget Style 1 & 2: Widget style is with thumbnails and Posts Title. These are the styles for your Blogger Popular Posts widget. Now Stylesheet code for that widget to apply mentioned below. Just Download the Code For the Style which you want to Apply to your Blogger Blog. Download the Code which you want to apply as per above Image. Now let’s see how to apply it to your Blogger Blog. Just Move to The Blogger Dashboard. On the Left Panel click Template > Customize. 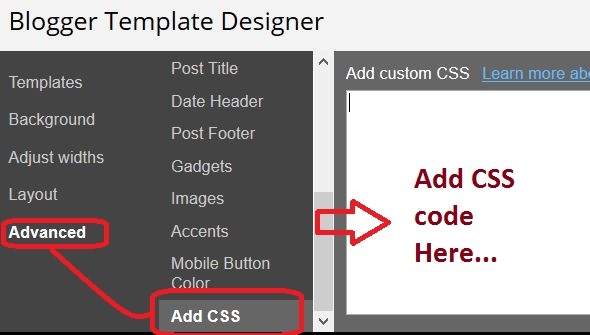 Now inside the Template Designer Paste the copied CSS code which You have Downloaded. Now Apply it and You are Done. View the Blog. You can change the Attributes like color, width, height, font etc.. inside the stylesheet code. Thanks and Comment below if it worked or not ! Next PostNext Teens using Facebook less: Prefer other Messaging Apps More !